Ongeim’l Tketau, or more commonly known as Jellyfish Lake, is nestled on a ridge on one of the Rock Islands (Eil Malk). Be prepared for a short hike along a ridge trail, parts of it steep enough requiring a rope guide. The trail also provides an opportunity to view the local fauna of birds, skinks (lizards) and the infrequent spotting of the skinks’ cousin, the monitor lizard. Leave the dive computer back at the hotel and most of the scuba equipment back on the boat, this is definitely a snorkeling adventure. Upon arriving, one reaches a clear water lake filled with millions of golden jellyfish. While the golden jellyfish maybe visible on the surface, the lake is also home to the moon jellyfish. The moons spend most of their time residing within the lake’s depths. Given the delicate nature of these jellyfish, the lake is for snorkeling only. The rising exhale bulbs from scuba trap inside the jelly’s tissues and, more or less, create a buoyancy trapping the jellies against the lake’s surface. Once pinned, the air only releases after forcing its way through the jelly’s delicate tissues, leaving a gaping wound. Except for diving watches and snorkeling equipment, leave your scuba equipment back on the boat. 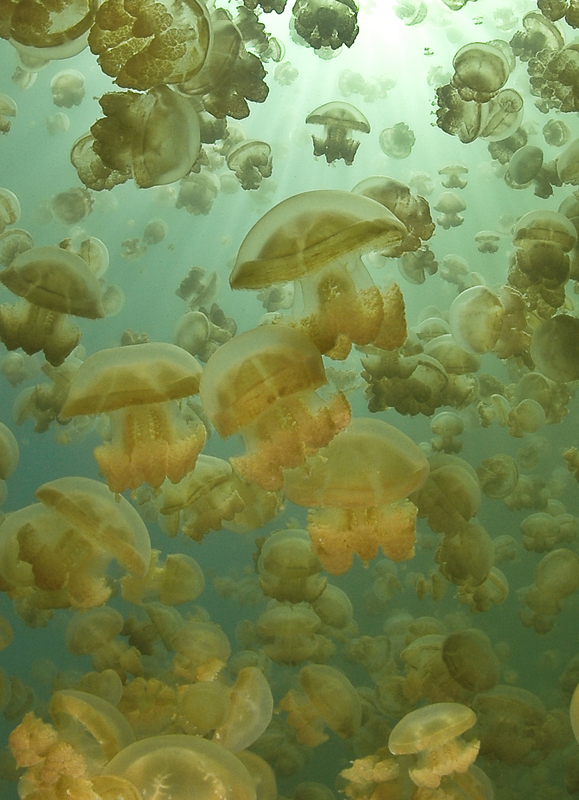 The number of golden jellyfish varies dramatically. In 1998, the water temperature reached 95 degrees. The hot water decimated the goldens, almost to the point of extinction. By 2005, the population had swelled to what was believed to be over 35 million. By 2009, the population was believed to be back down just below 5 million. On a normal sunny day, the golden jellyfish have a normal migration from the west to east and then back to the west, following the day’s sun. Their migration path pays close attention to remaining in the sunlight, avoiding the shade of the shores’ mangroves. The shade is home to the golden jellyfishes’ predator, the anemone. The golden jellyfish owes much of its golden color to the symbiotic relationship to the algae that lives within its flesh. In exchange for sharing the ride for sunlight and nutrition from the jellyfish’s waste, the algae produces sugar that provides much of the energy needed by the jellies. The golden jellyfishes’ diet also subsists on other micro animals it is able to subdue with what is left of limited venom. The jellyfish live in a delicate eco-balance. When you are there, a little respect for this balance goes a long way towards providing a healthy environment for the jellies and also the same pleasures for future vacationers. Entering the water clean is the best way to keep this micro eco-environment going. Make sure not to wear any sunscreen and wash any dive equipment before entering. Wear fins to reduce foot movement, create a more gentle movement through the water. The lake has enough of its own water; it doesn’t need people adding theirs.